LONDON--(BUSINESS WIRE)--Technavio has announced the top five leading vendors in their recent global electronic shelf labels (ESL) market report. This market research report also lists eight other prominent vendors that are expected to impact the market during the forecast period. An ESL is a system used by retailers to display the price of the product on the shelf and information related to it. The product price displayed on an ESL is automatically updated whenever a price is changed. ESLs can be highly advantageous to retailers as they offer the ability to make rapid pricing changes as often as needed or wanted, thereby helping retailers to reduce labor costs and improve pricing accuracy. According to the market research analysis, the global ESL market is expected to grow at a CAGR of more than 14%. The ESL market is highly fragmented because of the presence of several small and large vendors. Due to the rapidly changing environment, vendors are continuously developing new solutions that require high levels of innovation from its product development teams and suppliers. Many major players in the market have invested in R&D for the innovation of new products. “ESLs can be used to reduce the cost of printing labels and save staff time. Apart from their cost saving ability, they also have the potential to increase revenue and profitability for retailers,” says Poonam Saini, a lead retail systems analyst from Technavio. Altierre is a technology company that develops ultra-low power wireless technology to connect various remote objects in buildings such as manufacturing facilities, retail stores, hospitals, and others. The company develops a highly scalable, bi-directional wireless technology and a non-line of sight radio frequency (RF)-based technology. With multiple layers of security, it the most secure low power bidirectional wireless technology. Based on its patented RF mixed signal chip technology, the company has developed various schemes that serve both low power communications and driving displays. It serves the food, pharmacy, and non-food sectors. Displaydata designs, engineers, manufactures, and supplies digital display solutions that are incorporated with fully graphic electronic shelf labels and dynamic digital display solutions for omni-channel retailers. It also offers graphical three-color labels under the product lines Chroma Red and Chroma Yellow. Some of the clients of the company include Coop Denmark, T-Mobile Austria, and Orange Slovakia. Pricer provides ESL solutions to retailers and retail chains. It offers a complete range of labels for food retailers. It also offers standard labels for the shelf edge, specific labels for freezers, small peg hooks, deli cabinets; and larger labels for large signs. It offers various products for large, small, multi-chain, and single stores. The company focuses on developing cost-effective solutions and innovative products. It is focused on establishing its position in the French market and expanding its business in emerging markets. SES-imagotag offers electronic shelf labeling systems for food and non-food retailers. The company engages in designing, marketing, and installation of various ESLs. It also provides support and maintenance, project management, pre-installation and installation, and training services. The solutions offered by the company include labels, software, radio, and mountings and POP items. It mostly caters to the food, DIY, garden, and drugstore sectors. Teraoka Seiko is a provider of weigh labeling equipment. It develops original precision balance scales. It sells its product under the brand name DIGI. It serves various industries, including retail, food, logistics, and hospitality. The company offers ESL solutions with digitally coded signal that enable two-way communication with the tags. It also offers water-resistant and washable eLabels that are IP67 certified. The company's distinctive labels enable it to have a competitive advantage over its competitors. 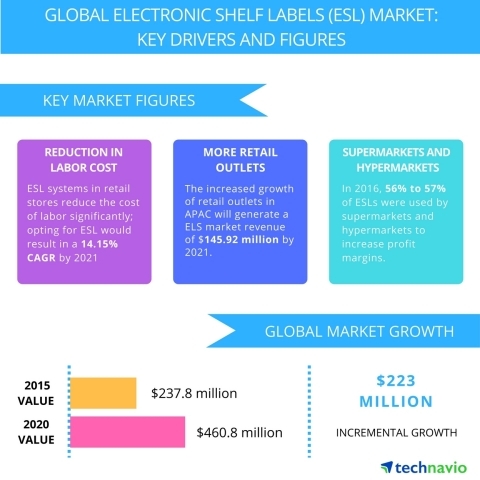 Technavio has announced the top five leading vendors in their recent global electronic shelf labels (ESL) market report from 2017-2021.